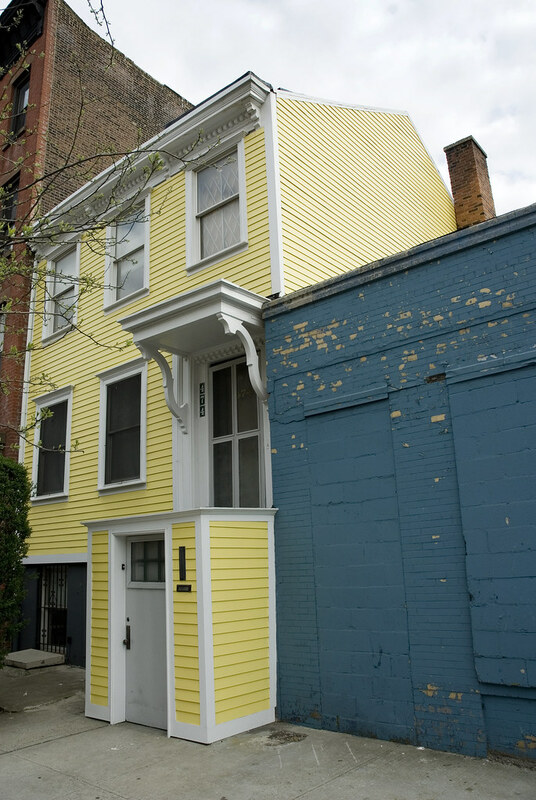 Meet 474 Dean Street, a three-story clapboard townhouse across the street from the footprint of Bruce Ratner's arena superblock. If Ratner has his way, this three-story 1,800 sq-ft house will be facing the south side of the Nets arena and Building 3, which, , would be the shortest high-rise on the arena superblock. According to the Atlantic Yards Draft Environmental Impact Statement, "the New York City Zoning Resolution prohibits arenas within 200 feet of residential districts as some of the operations could be incompatible with districts limited primarily to residential use." Because the State of NY is using its power to supercede the NYC Zoning Resolution, Bruce Ratner's Atlantic Yards plan circumvents this regulation. In other words, the Atlantic Yards plan goes beyond the Manhattanization of Brooklyn, because even in Manhattan, you will not find an arena across the street from a home, such as 474 Dean St.
Maybe Mr. Gehry could do something to incorporate the spirit of 474 Dean into his big buildings? Oh the poor little clapboard house on Dean. Boo Hoo. I think I'm tearing up. Hmm. Nope just some dust in my eye. What a shame to see the owners value skyrocket when the project is built.